Dr. Arun Kumar Mishra, PhD, is a Professor of Botany in the Centre of Advanced study in Botany, Banaras Hindu University. He has 19 years of teaching and 25 years of research experience with specialization in Microbial Genetics. His research mainly focuses on unraveling the mechanisms underlying calcium and iron mediated regulation of global nitrogen regulator gene ntcA as well as desaturase enzyme activity in Anabaena PCC 7120 and siderophore mediated attenuation of cadmium toxicity in Anabaena oryzae. He has also established the biochemical and molecular basis of organophosphate pesticide degradation by cyanobacteria and reported the role of two proteins viz. WP_017310637.1 and WP_017343813.1 in this process. 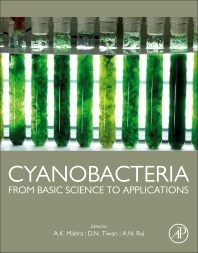 Apart from this, his laboratory also focuses on the systematics and phylogeny of diazotrophic microorganisms with special reference to the cyanobacteria. He has successfully completed researches sponsored by Department of Biotechnology, Department of Science, Council of Scientific and Industrial Research, University Grants Commission and Indian Council of Agricultural Research, Government of India. Dr. Devendra Nath Tiwari PhD, has served as Professor of Botany, Head of Department of Botany and Coordinator for the Center of Advanced Studies in Botany at Banaras Hindu University. He has 38 years of teaching and 41 years of research experience and published several research papers in reputed international scientific journals. His subject interest was focused on physiology and genetics of cyanobacteria especially N2 fixing systems. He also worked as Visiting Professor in Durham University, England (1985-1986), Michigan State University, USA (1991) and Mu’tah University, Jordan (1993) as well as Professor of Botany and Biotechnology and Dean at Mizoram Central University, School of Life Sciences (2006-2009). Dr. Amar Nath Rai, PhD, is a Professor of Biochemistry since 1987 at North-Eastern Hill University, Shillong, India. He obtained his BSc from Gorakhpur University, MSc in Botany from Banaras Hindu University and PhD in Biology from Dundee University (UK). He was awarded D.Sc. (Honoris Causa) by Rani Durgawati Vishwavidyalaya for his research contribution in the field of Life Sciences. He has researched and published extensively on various aspects of cyanobacterial physiology and biochemistry covering N2-fixation, nutrient exchange in symbioses, artificial symbioses, nitrate metabolism, development of heterocysts and akinetes, ammonium transport etc. He has been a Visiting Professor at Uppsala University and Stockholm University, Sweden. Dr. Rai has served as Vice Chancellor of Mizoram University and North Eastern Hill University, and Director of the National Assessment and Accreditation Council (NAAC) of India. He has also been Member of Scientific Advisory Committee to the Government of India and Central Advisory Board of Education (Government of India). He is a Member of Standing Committee for Promotion of Women in Science (Dept. Science and Technology, Gov. India).